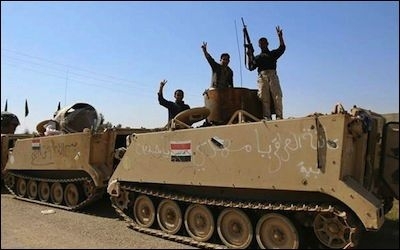 On Monday the Iraqi military launched its largest operation to date against the self-declared Islamic State (IS), also called ISIS, to retake control of the city of Tikrit. Alongside the Iraqi military, the coalition fighting IS in Tikrit includes Kurdish and Sunni tribal forces, but it leans heavily on Iranian backed Shia militias and reportedly includes a contingent from Iran's revolutionary guard. The urgent question now as the battle against IS intensifies is whether any US policy to defeat IS in Iraq can achieve its aim without ceding the country as a base for Iranian expansionism. Can Washington defeat IS in Iraq without ceding the country as a base for Iranian expansionism? A virtually identical tactic is now being implemented in the offensive to capture Tikrit, except this time with Iraqi fighter jets taking the place of U.S. airpower. There is much to be said in favor of these arguments. Since the fall of Mosul to IS in June 2014 and the call to arms issued by Iraq's most senior Shi'a cleric Ayatollah Sistani, militias that are ideologically aligned with Iran ('Khomeinist') if not actual proxies have proliferated most, with many new brands emerging beyond the three mentioned above. A considerable degree of overlap exists between these new groups. For instance, one commander I interviewed is simultaneously involved with two recognizably Khomeinist militias: Kata'ib al-Imam al-Gha'ib (a 'Hezbollah' brand) and the Mujahideen of Iraq Brigade, the 'military wing' of the Nasrallah Islamic Movement (named after Hezbollah leader Hassan Nasrallah). Iranian proxies are spearheading most new offensives by government forces against IS. Beyond the question of Iranian influence, those who defend the 'Popular Mobilization' trend as a military necessity tend to downplay the more general negative consequences of militiafication. There is little reason to accept former U.S. defense official Douglas Ollivant's contention that the militias "will either return home or be regularized by the central government in some way" once the IS threat is dealt with. Militias also create an atmosphere of lawlessness and criminality regardless of the sectarian issue. Indeed, some of the militias themselves have acknowledged the problem of kidnappings and stealing in their name, including a Khomeinist militia known as Kata'ib Ruh Allah. The complaints about Iran's expanding influence in Iraq are valid, but they raise an important question that has yet to be answered. How exactly do you curb Iranian influence at this stage when its forces dominate in Iraq? The usual line here is to say that the U.S. needs to stop abetting the Iranian proxies through airstrikes and arms provisions to the Iraqi government. But going back even conditionally on these measures simply creates a bigger military vacuum for Iran to fill. At the same time, Iranian proxies are undoubtedly spearheading most new offensives by government forces against IS and at least some of the new weapons shipments intended for Iraqi security forces are likely to end up in the hands of Iranian proxies. One also hears calls for new U.S. engagement in Iraq, but there is no honesty about the scale of commitment that would be required. If the goal is to rebuild Iraq's conventional security forces as an alternative to the militias, then the reality is that there will have to be tens of thousands of ground troops, deployed for a number of years and not only willing to train these new forces but coordinating with them in combat missions. Yet even such a massive commitment—tried once before in recent memory—has no guarantee of success. Such an approach is also politically unfeasible due to American war weariness and skepticism of any mission with shifting goalposts. Further, a large-scale American ground presence risks fuelling further support for IS, the possibility of infiltration of rebuilt army brigades by the Iranian proxies, and open warfare between the proxies and U.S. troops. There are no viable 'third-way' Sunni actors who reject both the government and IS. With supposed Sunni allies, the biggest question remains of who is out there for the U.S. to approach. Sunni insurgent actors like the Ba'athist Naqshbandi Army find themselves severely weakened, having lost out to IS in all major towns and cities outside of government control. Local Sunni forces that are actively pushing back against IS in Iraq's Anbar province are in fact already working with the Iraqi government and the militias but have been unable to dislodge the group.